We have Just Sold out of Star Wars The Last Jedi Porg Enamel Key Chain. Not to Worry! Fill in the Notify me When Available and you will be the first in line for our restock of Star Wars The Last Jedi Porg Enamel Key Chain !! From the Star Wars The Last Jedi collection by Bioworld. 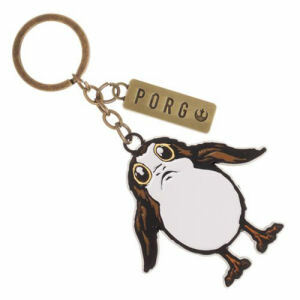 Star Wars The Last Jedi Porg Enamel Key Chain. Enamel Key Chain includes an enamel charm of Porg and a metal Porg charm with the rebel sumbol on it..
Bioworld Star Wars Key Chains shipping from Canada. No Surprise Border fees or Customs!